British rule of India brought together two very different traditions of scholarship about language, whose conjuncture led to several intellectual breakthroughs of lasting value. Two of these were especially important: the conceptualization of the Indo-European language family by Sir William Jones at Calcutta in 1786—proposing that Sanskrit is related to Persian and languages of Europe—and the conceptualization of the Dravidian language family of South India by F.W. Ellis at Madras in 1816—the “Dravidian proof,” showing that the languages of South India are related to one another but are not derived from Sanskrit. These concepts are valid still today, centuries later. 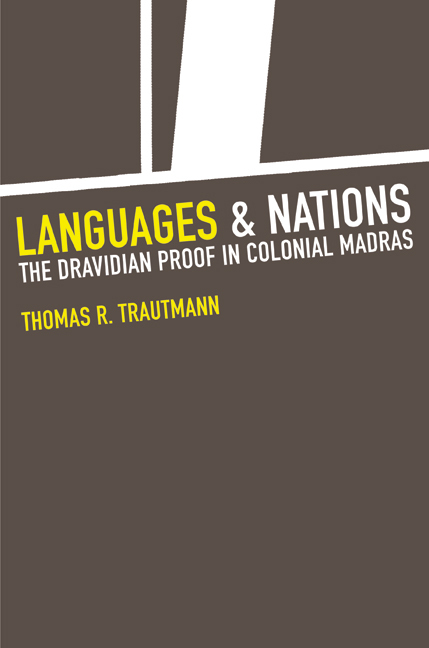 This book continues the examination Thomas R. Trautmann began in Aryans and British India (1997). While the previous book focused on Calcutta and Jones, the current volume examines these developments from the vantage of Madras, focusing on Ellis, Collector of Madras, and the Indian scholars with whom he worked at the College of Fort St. George, making use of the rich colonial record. Trautmann concludes by showing how elements of the Indian analysis of language have been folded into historical linguistics and continue in the present as unseen but nevertheless living elements of the modern. Thomas R. Trautmann is Marshall D. Sahlins Collegiate Professor of History and Anthropology at the University of Michigan. Among his books are Aryans and British India (UC Press, 1997), Lewis Henry Morgan and the Invention of Kinship (UC Press, 1987), and Dravidian Kinship (1981).